Clara Natanine is a youth leader from the Inuit town Clyde River. In 2011 she spent a week with us Young Explorers during the Pangaea Program Mike Horn Nunavut expedition. Now she continues to fight for environmental protection in her Arctic home. We asked her about the current campaign with Greenpeace against seismic blasting. Hello, my name is Clara Natanine, I am from Clyde River, Nunavut, Canada. I am currently 22 years old, but my birthday is coming up pretty soon *hint*. I grew up in Clyde River but when my father went to college in North Bay, Ontario, we moved there for 3 years and that is where I learnt how to speak and write in English. After a few years in North Bay, Ontario we moved back to our home town here in Clyde River. My father and I recently were a part of the Greenpeace ship journey, along with our Mayor, James Qillaq. The reason we were on the Greenpeace ship was because that the community of Clyde River is fighting the biggest fight of the year, which is to stop the Seismic Blasting that might occur in Baffin Bay and Davis Strait near our community. There are 80-90% of the world’s biggest Narwhals and whales living in that area which is the place that the oil companies want to do a Seismic Blast to look for oil underseas. We, the community of Clyde River residents, are taking action to stop the Seismic Blasting from happening. Solar Panels were installed on the Community Hall to show that we do not need dirty diesel generators for electricity. During our trip where we sailed off from St. Johns onto Clyde River, we brought some Solar Panels that were installed on our Community Hall on the 23rd of August. The Solar Panels that were installed are to see if we could get more efficient power using natural light and a lot of people disagree that they will not work but amazingly Solar Panels just needs some light, so during the cold winters they will still be able to charge because of the bright snow. We burn diesel fuel for light and the Solar Panels were donated to the community so, soon our community hall will be energized by light and will be using less diesel and that would help a lot with the cost. Seismic Blasting is when big bad oil companies want to damage our hunting grounds and blast air guns under our Arctic Sea every 10 seconds, the air guns would keep blasting and it would take a few weeks to finish. Which it would very much likely destroy our water, the sea animals that live there and all other animals that rely on the sea could possibly become deaf, blind, and even could lead to death. We as Inuit’s don’t eat disabled or animals that are hurt because if we do, they could also hurt us or make us sick if they had some kind of disease from the wounds they would get from the blasting of the air guns. Because if the oil companies do their testing in our area, what would we hunt? What would we eat? The community of Clyde River are doing all that they can with the help from Greenpeace because if the oil companies do their testing in our area, what would we hunt? What would we eat? How would we survive? There are a lot of bad things that could happen, and not only would Animals be affected but I believe that the whole community would be hurt too. We have only 1 store in our town and believe me, it is not that easy to rely on because of the high prices, even with subsidy it is hard to afford food so most of the time we rely on seals, narwhales, fish, clams, ptarmigans, and a lot of other animals we are used to hunting and eating. During the time that the Greenpeace ship and the campaigners were in town, they have been very busy. At first there was a presentation from Dr. Lindy who is an expert on marine animals and she showed us in her presentation how the marine life would be effected if Seismic Blasting happens. There was also a presentation from Professor Chris and Duncan which the topics were about the Solar Panels and how they can help us save a lot of money. Some Digital Training was a part of this campaign too, to learn how to use Snapchat, Instagram, Twitter and other social media to make a change and for our voices to be heard around the world. There was also a campaign on How to do a Campaign; which was pretty interesting because I didn’t know much about how they do all this but after that workshop we did. There was also a very delicious big feast for the community and the crew workers of the Greenpeace ship celebrating the awesome Solar Panel Installation. There was a performance by 2 young ladies that were throat singing, and after that there was Square Dancing, which everyone was amazed and it was a wonderful time. The goal of all this is that Clyde River is fighting its way to the Supreme Court on November 30th. No way that we were going to just sit around and wait for that day to come, instead we worked with Greenpeace. They helped us and we help them to let all our voices be heard and to get all the support we can get from all around the world. The little community of 1000+ people in Clyde River are standing with Greenpeace to Save the Arctic! It’s our home! I talked with a couple of local people that has been attending the trainings and following what we talk about and share on social media, told me that a lot of people are supporting this fight because if we do nothing about it, we won’t change anything. But if we fight for our rights and for the other Indigenous people around the world, we can be heard! 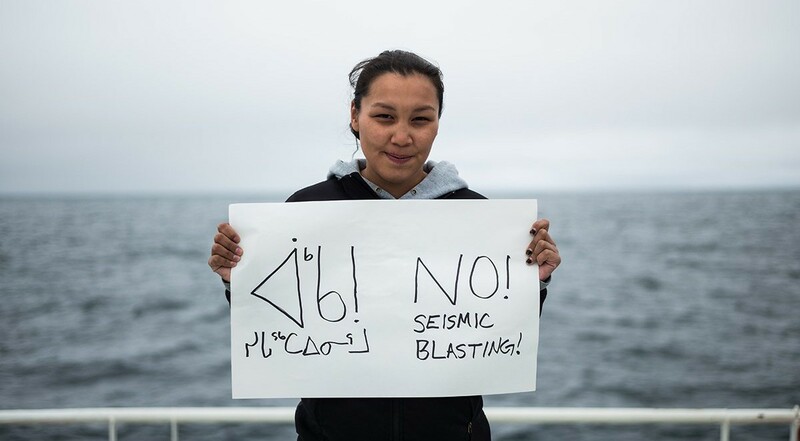 We can make a change and we can stop the Seismic Blasting in Baffin Bay and Davis Strait, because if they do a blasting in that area, the City of Iqaluit, Qikiqtarjuaq, possibly Pangirtung and Clyde River will all be affected and that would make a huge riot if Inuit’s won’t be able to hunt or even live off the food we hunt for to support many families. I know and I feel that most people are involved in this fight because they don’t want their culture extinct, we want our traditions to live on for another hundreds of years! During the first days at St. Johns, my dad, James and I were all ecstatic, even going on the big jets to get to our destination was an adventure! We had a great time, met great people, saw old friends, and even made some best friends along the road. What I personally liked about all this was the fact that I had no idea who most of those people were and I barely understood what I was doing but as days went by and we were all settling down, I knew that by the time this journey is over, I am going to have some awesome people in my life. I know I can get help from them if I needed it and they were all very out-going, so generous, and very kind and sweet. I learnt to not be shy, and also make my name known to people and my voice heard and listened to! Now I have hope for my Arctic home! I myself believe that I was a shy person, but I have opened up myself in such a way I never thought I was capable of. Now my name is known to many people, my voice is actually being heard and listened to. Just thinking about that puts my big smile on and gives me a lot of hope that in the near future everyone will be celebrating with us because I have a feeling we can win this fight. We can stop the seismic blasting and we are marching to the Supreme Court of Canada with millions of people to save my Arctic Home! That is my biggest wish for the future!! Link to the Greenpeace Campaign.